Semihard cover case with back pocket and different prints with a perfectly fitting design. Semihard cover with back pocket where you can store your coins and small items. The prints on the back, depicting funny little animals, give color to the cover. 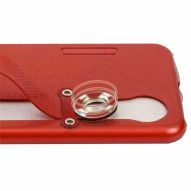 With a perfectly fitting design, the case offers complete protection and a simple and direct access to all the functions of the device. Features: back pocket; direct access to the touchscreen controls and ports; semihard; different prints.